RAWALPINDI: The Islamabad High Court on Wednesday extended interim bail of Asif Ali Zardari and his sister Faryal Talpur till April 29 in fake accounts case. A divisional bench of the court comprising Justice Amir Farooq and Justice Mohsin Akhtar Kayani heard pleas filed by the PPP leaders through their lawyers. During the hearing, Justice Amir Farooq asked Sardar Muzaffar Abbasi, Deputy Prosecutor of NAB, when the anti-graft body would submit its response. The prosecutor told the NAB would submit its response by Thursday. 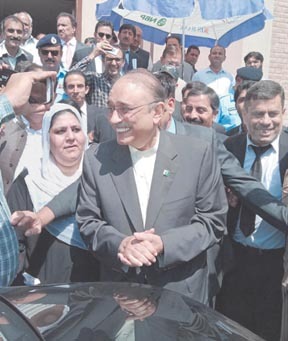 ISLAMABAD: Apr08- Former President of Pakistan and Co-Chairperson of Pakistan Peoples Party (PPP) Asif Ali Zardari leaving the accountability court after hearing, Asif Ali Zardari and Faryal Talpur to face charges of money laundering case. He informed the court that the former president was facing three inquiries and two investigations. He said he was unaware of the reports being run by the media. After the brief hearing on the applications of Asif Ali Zardari and Faryal Talpur, the court extended interim bail till April 29. During the previous hearing, the court had approved the interim bail of PPP leaders till April 10.